This is the time of year where many of us prepare to put our motorhomes and trailers away for winter. In this column, I will review the steps required to properly winterize your RV. Before starting, make sure you know the locations of your fresh water tank drain valve/cap, water heater bypass valve(s), water pump winterizing valve and tube, as well as the low point drains. This information can be found in your owner’s manual or visit an RV service center for assistance. If your unit does not have a water heater bypass or water pump winterizing tube I highly recommend installing them, as they make the winterizing process much easier. For this procedure, I will assume these components are present. The first step is to completely empty the black and gray water holding tanks. This likely requires a visit to your local dump station. It is a good idea to have a sufficient volume of fresh water on board to flush the black tank after dumping. Open any cold and hot water tap. Drain the fresh water tank by opening the drain valve or removing the drain cap. Open the low point drains on both the cold and hot water lines. Close them when water no longer flows. Turn off the water heater (propane and AC). Drain the hot water tank by removing the plug (for aluminum tanks) or anode rod (for steel tanks). Note! Be extremely careful during this step, as personal injury may result from scalding if the water is still hot. Ensure you are standing out of the flow path. Once the hot water tank is completely empty, replace the plug or anode rod. It is a good idea to use Teflon tape (PTFE) on the threads. Do not use a steel plug in place of plastic, as this can result in galvanic corrosion between the two metals, possibly causing the plug to fuse to the tank threads. Inspect the anode rod for wear and replace if required. Do not use an anode rod in an aluminum tank such as an Atwood, and always use an anode rod in a steel tank such as a Suburban. Turn off all water taps. Close all water filter shutoff valves, drain the filter bowls, and remove the filter elements. Close the water heater bypass valve(s). Open the winterizing valve for the water pump and insert the tube into the antifreeze bottle. Starting with the tapset furthest away from the water pump, open the cold water tap until antifreeze flows out of the faucet. Repeat the process with the hot water tap. Let the antifreeze run long enough to fill the P-trap. Repeat this process for all tapsets in the RV, including all outside faucets. Periodically check the antifreeze bottle and replace it if the level goes too low for the pickup tube. Flush all toilets until antifreeze flows into the bowl. 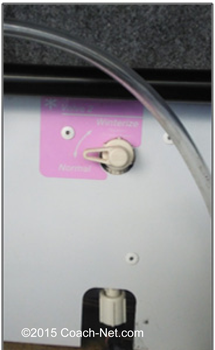 If you have a dishwasher or washing machine, winterize it according to manufacturer instructions. Once all plumbing fixtures have been winterized, close the water pump winterizing valve and remove the antifreeze bottle. If there is antifreeze left over, pour some into each drain and toilet bowl to ensure the P-traps are filled with antifreeze. Antifreeze does stain, so be sure to wipe up any spills. To ensure you have easy access to this handy checklist every year, feel free to download, print, and share with your RVing friends. Do i have to put all batteries inside even the one for the motor? Do i have to blank all Windows to prevent against sun? If the RV is in storage, covering the side windows helps prevent UV deterioration to the inside of the coach. However, this can be accomplished simply by closing the blinds. It is recommended to cover the windshield. You should also put tire covers on the vehicle. You can certainly remove the engine battery, and should do so if the unit is in long-term storage. In this case, you should also prepare the engine and chassis for long-term storage as per manufacturers instructions. What is generally recommended instead, assuming the unit is close by and accessible, is to run the engine periodically during storage. This prevents damage to the engine and chassis, and also allows you to generally check-up on the unit while it is in storage. It’s a good idea to turn off the water pump and open a hot water faucet BEFORE removing the plug or anode rod. This eliminates system pressure so you don’t get very wet! Could you please follow up with instructions for those of us who live in our RV’s in the south in the winter. Sometimes the temperature goes below freezing. Our unit is supposedly winterized, but what hidden surprises might we encounter? For instance, what is the best way to insulate the fresh water hose? Should we empty the fresh water tank, or leave it full? Suggestions? By winterized, in this case, it is assumed you mean that it has a winter or “arctic” package. This generally means that the tanks are heated, the plumbing runs are not directly exposed to the outside air, and the coach insulation is better. Although these coaches are often not protected for the cold winters in the North, they should be fine for Southern winter climates. However, to err on the side of caution is not a bad idea. For the fresh water supply, first make sure the park spigot is itself heated. For the hose itself, you can purchase electric heated hoses that are expensive. For full and definite protection, it is recommended to buy one of these. However, you can also choose to wrap your hose in neoprene pipe wrap. This is the type commonly used for domestic use and is available very cheaply at home improvement stores. You can wrap this around your hose and tape it closed. In terms of the fresh water tank, it is recommended to drain it regardless of whether your unit has the arctic package. The final trick you can try to prevent the water from freezing is to crack open a cold water tap during the night (as long as you have your grey water valve open to the RV sewer) to keep the water flowing. How do I winterize the ice maker. When I bought the MH the ice cube trays had very thick gooey pink antifreeze in it. The most important thing here is to remove food from the unit during storage. Empty the coach completely of food, even plastic containers won’t stop them. Prevent access as best you can by sealing off as many openings as you can find. Often you will find there is access into the coach through a firewall or hole in the floor. Sometimes the access holes for the plumbing are larger than they need to be. Seal off any such openings with spray foam, wood, or sheet metal. It is also a good idea to put fine mesh screens or blockers over the furnace vents to prevent spiders and mud daubers from nesting in there, but don’t forget to remove it when you take the coach out of storage. Spread mothballs throughout the inside of the unit. Rodents don’t like the smell any more than moths do. This is actually a very effective way to keep critters out of your coach. Finally, you may choose to set traditional traps in addition to the moth balls. Don’t be tempted to use high-tech gadgetry such as ultrasonic traps, as moth balls seem to be tried and true. When you take the unit out of storage, don’t forget to blow webs, nests, etc. out of the water heater burner, furnace, and fridge. In addition to your recommendations I’ve found that little critters enter your RV by climbing up the power cord and or hoses. I keep these off the ground and pay attention to their routing during storage and during seasonal use. Believe me, it helps!